For years the Frontiersmen had been certain that war with German was inevitable. As soon as war was declared a trickle of Frontiersmen, which soon turned into a flood, arrived from all round the world at the little office on the top floor of 6 Adam Street London. The steady stream of rough, often Colonial, men dressed not in London clothes but in practical Colonial garb, wending their way down Adam Street and up the narrow staircase to the Frontiersmen office would certainly have raised eyebrows in this well-to-do part of London. Some 1,500 Australian and New Zealand Frontiersmen died with the Anzacs in Gallipoli. Not only were Frontiersmen from Winnipeg, Canada, making their way to Valcartier Camp, but according to the “Dundee Courier”: “Several impatient members of the Winnipeg Legion of Frontiersmen turned up in London on the chance of being included in an early draft for France.” These were among many Frontiersmen who worked their passage across the Atlantic. Although the War Office would not initially grant Driscoll a named Frontiersmen unit, these men with their great skills in mastering horses were of inestimable value horse-breaking at Shirehampton and Swaythling. The “Calgary Daily Herald” of October 5th 1914 reported that 50 Frontiersmen who had grown tired of waiting to be called into active service had made their own way to London and presented themselves at the War Office. According to the newspaper they eventually got to see Kitchener himself and having had their service accepted reported that: “We are leaving for Southampton in a day or two.” One can assume that they had been sent to the Remounts. Before the declaration of war, the offer of one thousand picked men for serving anywhere on earth was promptly acknowledged by the Army Council. After the war was declared a second communication was received from the War Office thanking the Legion for their patriotic offer, but informing them that until the young force of 100,000 being raised by Earl Kitchener was complete nothing further would be done regarding the raising of extra regiments for the front. The offer still being with the War Office, members of the Legion will have to wait orders patiently like good soldiers. Since the outbreak of war, numerous cables have arrived from our commands all over the earth offering to pay their own expenses and join us in England. It has been very touching to be unable to cable back to them to join their comrades in England. However this may come at any time. The recruiting for the Legion all over England has been remarkable. In London alone some 5,000 men of the very best stamp have been registered at headquarters, so that we are able to offer to the War Office in England alone at least six mounted or dismounted regiments of the finest fighting men in the world outside the British Army. Yesterday a cable was sent from the Governor of Newfoundland to the Foreign Office asking for permission from the Legion of Frontiersmen headquarters to permit one hundred of the Legion of Frontiersmen in Labrador and Newfoundland to join the Canadian expeditionary force. Colonel Driscoll desires all members of the Legion to be patient and to go on diligently preparing themselves for active service, so that if the country needs them they shall be more than ever prepared to go to the front without delay. Colonel Driscoll endeavoured to supply one or more regiments to Earl Kitchener’s 100,000 men, but was informed that only young men of a certain age would be accepted. The average Legion age is above this. Many hundreds of members of the Legion have joined various military departments with the full and unqualified approval of headquarters. The Argentine Sub-Unit of the Legion of Frontiersmen, London Command, was officially constituted on November 1st 1912, the organising officer was Lieut E. W. Benson, LF. When war appeared inevitable, the Sub-Unit cabled to England on the 31st July 1914, offering their services to the British Empire for any part of the world, and undertook to equip themselves completely and be fully mounted. At that time there were twenty-seven members on the nominal roll, Malcolm Pulbrook being Organising Secretary, and of these men twenty-three travelled to England before the end of the year to join up, the majority sailing in August and September 1914. The remaining members were at that time debarred on account of age. As most of the men had seen active service in some part or other of the world, and were fully qualified in drill and shooting, they were rapidly taken into the army, and before the close of 1914, several of them were at the front. Pulbrook served as a driver in the Royal Engineers and E. W. Benson as a Lieutenant in the Bedfordshire Regt, attached to the RE Signals. He was awarded the Military Cross. Although we have so many accounts of the remarkable patriotism and eagerness to serve shown by Frontiersmen all round the world there were examples of Frenchmen showing equal dedication. The “Sheffield Telegraph” told of two French reservists who were working as trappers on the Mackenzie River some 1300 miles from the furthest north-west railroad in Canada. By September 30th 1914 they had tramped towing a sled to Fort Chipewayan on Lake Athabasca where a Canadian Mounted Police officer gave them a letter of explanation as to why they were so late reporting for duty to present when they reached France. They still had another 700 miles to walk through the Canadian winter before they reached a railroad. No Corps in the world possesses the elements of adventure in so great a degree as the Legion of Frontiersmen nor carries so many decorations for Active Service and Valour. The Legion has gathered into its ranks men whose collective adventures in all parts of the world would make as thrilling and absorbing reading as any volume of fact and fiction ever published. This parade, some 350 strong, was held about nine weeks before the start of the War. not only of members from all round Britain, but also representatives from Malta, Persia, Calcutta, Nigeria, Australia, the Federated Malay States and other countries, all of whom had also attended the previous day’s Legion A.G.M.. When the War Office called for a further inspection, this time on the very hot Sunday 7th September, the Frontiersmen were inspected in London by General Bethune, another South African veteran. About seven hundred of them marched from the Embankment to Vincent Square to be inspected. It would have been more impressive had Driscoll been able to raise his promised two thousand, but his defence was that these were mainly men who lived in or near London. Some of the Manchester Troop were there, also the Lord Mayor of Manchester. According to a writer in “The Sketch”, “..what a magnificent set of fellows they are…” The brief extract from Bethune’s report to Kitchener surviving in War Office files stated that the men were “typical toughs who would do most excellent work as irregulars”. This statement quoted in War Office files out of the context of the full report sounds critical of the quality of the men, but it should probably be read the other way, that the Frontiersmen would be suitable for the way they wished to serve. There can be no doubt that Frontiersmen were often tough characters and some were “known to the police”. In 1919 the “Manchester Guardian” told of an incident in 1915 when the police were searching for a wanted man. It was suggested that the man might have enlisted in 25th Bn. Royal Fusiliers (Frontiersmen) to gain a swift passage out of the country. A plain-clothes policeman was sent from Manchester to London to see if he could identify the man among Driscoll’s troops preparing to entrain for their ship. Asked whether he had found his wanted man, the policeman replied “No, but I recognised all the others”. Possibly true or possibly false, but the story does show that however rough and tough these men were, they remained intensely patriotic. It is difficult for us, over a century later, to comprehend the attitude of these men. The most extreme case is that of fifty-four year old Edgar Keeling, a Manchester Frontiersmen. He was desperate to re-enlist, but although he was an expert rifle shot and known as a sober and respectable man, neither was he allowed due to his age to go with the Manchester Frontiersmen to Belgium nor was he accepted by any army unit. He was so depressed that he could not fight for his country that he committed suicide with his old service rifle which he had somehow retained. If we go forward to 1939, although Frontiersmen were willing to fight for their country, it was with a grim determination to defeat Fascist Germany. The enthusiasm which brought men from all over the world to enlist in 1914 was not there. After the First War many survivors had moved with their families to countries such as Canada, New Zealand and Australia, taking up nationality. As we have pointed out in previous items on gas warfare training the First War had only ended some twenty-one years earlier, well within memory. Most families had lost family members. In the final years before the start of the Second War the Territorial Army was busy recruiting and actively seeking out the younger Frontiersmen as they would already have been well-trained. Senior army officers from the First War were happy to serve as rank and file Frontiersmen and it was often the younger men who were elected as officers. Ernest F. Meacock, a Second Lieutenant in the Frontiersmen, was sought out by the Territorials and commissioned. He wrote that he had to be reminded by his sergeant that “The order, sir, is ‘Squad!’, not ‘Frontiersmen!'”. The Frontiersmen will always carry on raising a glass to “The Nine Thousand”. Strand 1: The spy novel as epitomised by William le Queux in The Great War in England in 1897 (1894) and The Invasion of 1910 (1906). Strand 2: The Legion of Frontiersmen started by Roger Pocock in 1904/5. Strand 3: The political and social structure of Britain. Strand 3 is most important to understanding how the secret service came to be. The Crimean War (1855) and the earlier Peninsular Wars (1807-1815), the American Civil War (1860s) and Anglo-Boer War (1899-1902) changed perceptions of the army. Technological developments such as the railways, steam engines, telegraph, wireless and photography as well as flight, changed the nature of war and people’s ability to travel. This all linked with the scramble for Africa and the development of Empire which needed to be protected to ensure a source of raw materials and markets for the sale of manufactured goods. This brought countries into conflict with each other, a point reflected in the novels of the day. During the 1800s France was enemy number one as depicted in William Le Queux’s novel The Great War in England in 1897. This was to last until after the Boer war, as France supported the Boers in spirit being anti-British at the time. When Britain reconciled with France in 1904, Germany became the ogre as seen in Le Queux’s The Invasion of 1910. Follow through to today and the same holds true: think of James Bond, Die Hard, The Bourne series and more recent television programmes such as NCIS, Crossing Lines and Deep State. Strand 2: At the start of the previous century, Germany was increasing the size of its navy which posed a direct threat to Britain’s mastery of the sea. With the growth of Empire came colonisation and the need to protect the Empire’s assets which is where Roger Pocock saw a role for the frontiersman and woman – the person who helped maintain some sort of order along the borders and pushed into other territories to see how far he could go. Roger was inspired with how the amateur or frontiersman could support the Empire, ideas gleaned through his experience of visiting the Crimea in about 1895 and later in 1904 when he visited St Petersburg. He was able to share his information with the Admiralty, in particular with the Director of Naval Intelligence, Prince Louis of Battenburg who saw the value of what he’d been given. Roger Pocock had served as a Canadian frontiersman and learnt the hard way about survival and friendship before heading to South Africa and the Boer or South African War of 1899-1902. Between his time with the North West Mounted Rifles, later Police, when he lost some toes due to frostbite, and going to South Africa in 1900, Pocock had travelled widely taking work on ships to pay his way. In 1898 he organised the Klondyke expedition which aimed to take pack-horses to the new mining frontier in Canada, an expedition which failed, and which hounded him for the rest of his days when Sir Arthur Curtis disappeared, believed murdered. Soon after, Roger undertook to travel on horseback from Canada to Mexico, a distance of 3,600 miles through the American deserts. He then went to South Africa in 1900 where he served with Waldon’s Scouts and the National Scouts until his time expired on 31 March 1902,3 two months before the war ended. Between his travels, he was based in London where he wrote and published novels detailing his adventures. The Boy Scouts, Territorial Army and National Reserve all followed in the wake of the Legion, Roger believing the Legion had influenced their organisation.7 Baden-Powell was apparently visiting Lonsdale at the time the formal organisation of the Legion was being discussed.8 The Boy Scouts organisation was founded on 24 January 1908, later that year, Pocock’s friend and fellow author, Owen Vaughan also known as Owen Rhoscomyl and Robert Scourfield Mills published a book on scouting and Baden-Powell himself followed with On scouting in 1909. The Territorial Army having been under discussion as part of the army reforms introduced by Lord Haldane following the Anglo-Boer War was finally inaugurated on 1 April 1908 and the National Reserve came into operation around the same time. Roger had led the pack. In 1909 he published The Frontiersman’s Pocket-book, the list of contributors including some of the ‘well-known names’, a number of whom were members of the Legion of Frontiersmen, others specialist in their field but all determined to support the Empire in its time of need. Significantly, Roger did not ask Daniel Driscoll to contribute to his Pocketbook, despite Driscoll having been significantly involved in recruiting for the Legion and his own frontier experiences including participation as a scout in the Anglo-Boer War. His exclusion might have had something to do with his close association with exaggerated numbers of spies. Members of the Legion who did not feature in the book included those linked with spies and stories of invasion, most notably Lord Roberts and Henry le Queux. Strand 1. The way to engage the public and to make the army ‘real’ was to create a need on home soil which could be more easily understood than issues around far-off places which the majority would never get to see and would probably not even hear about unless it was mentioned in the newspapers. The way to get the home front on board, was through a real or imagined invasion of the island and a supportive newspaper owner. Alfred Harmsworth, from 1905 to be known as Lord Northcliffe and from 1908 owner of The Times, in 1888 started a paper called Answers to Correspondents. Between December 1893 and 2 June 1894, Harmsworth ran William Le Queux’s The Great War in England in 1897 under the title The Poisoned Bullet as a serial which focused on conflict between Britain and France. Le Queux’s next big seller, The Invasion of 1910 was serialised in 1906 with the launch of the Daily Mail on 4 May. The Invasion of 1910 had been informed and endorsed by Lord Roberts who was keen to use it to encourage support for National Service (conscription). The serial and later publication in book form were a success. Wesley Wark in Spy Fiction, Spy Films and Real Intelligence says that William Le Queux was the pioneer of the faction industry – deliberately blurring lines between fiction and fact, presenting himself as spymaster. ‘With Le Queux apparent realism first showed its amazing potential.’10 In 1908 when Northcliffe took over The Times, the paper became the voice for National Service. The Boy Scouts were encouraged to report a German spy for their good deed a day,11 and when the Weekly News offered £10 for evidence of German spies operating in Britain, letters poured in thus providing the evidence required by the War Office to set up a secret services bureau in 1909. Edmonds requested a subcommittee of the Committee of Imperial Defence (CID) in 1909 to approve the formation of a counter espionage group as ‘we have … no regular system or organisation to detect and report suspicious cases, and are entirely dependent on casual information.’ Lord Esher, chairman, believed the threat posed by spies was not as great as was presented, however he was eventually worn down with the evidence supplied by the War Office and Lord Haldane. The Secret Service Bureau was formed and split between the military and navy, but within a year, a home department responsible for counter espionage replaced them, eventually becoming known as MI5. A foreign department was responsible for espionage. It was later to be known as SIS and then MI6. To start, it remained responsible to the Admiralty but little evidence of an invasion was forthcoming – the plans did not exist. A system of spies was set up in Germany by Manfred George Smith-Cummings as head of the foreign section and this helped in supplying accurate information about weapons and ships, and from 1913 on zeppelins and their possible usage.13 When the Great War eventually broke out in 1914, another rearrangement of the organisations eventually resulted in the formation of MI5 for internal security and MI6 for international. In effect, Le Queux’s work influenced that of MI5 and Roger Pocock that of MI6, both members of the Legion of Frontiersmen. The illustration is from Le Queux’s Invasion of 1910. In the text he tells how the brave Frontiersmen were involved in the defence of London. Dr Anne Samson is Special Advisor on Africa to the History and Archives Section of the Legion of Frontiersmen. She is an independent historian who has published widely on the Great War in Africa. The complete paper will be published in the Victorian Military Society Journal, Soldiers of the Queen (SOTQ) in late 2018. VMS kindly allowed a summary of the talk to be made available. © Copyright Anne Samson. All rights reserved. This article may not be reproduced in any form, in part or in full, without prior permission. Topic June/July 2018. Before we located the I.W.M. photograph of Sidney James Alexander M.C. outside Buckingham Palace, all we had to start with was a rather faint photograph of him in Frontiersmen uniform. By that time he had acquired some rotundity and his face had filled out from the gauntness it showed when he was presented with his Military Cross by the King, but he still retained his military bearing. The Legion of Frontiersmen used a rank “RSM-in-Chief” that was quite clear to all. The first RSM-in-Chief we have traced was Sidney Alexander. Legion records tell us no details about him, but we have discovered a little more about a brave and sometimes controversial soldier. We do not yet have anywhere near his full life story, but his military career is evidence of the social divides of his time. Sidney Alexander was born on 28th May 1874. His army career began officially at the age of 18. As an ordinary soldier, no military record was held of his service and in what campaigns he fought. We only know that he was discharged after 21 years service in February 1914 with the rank of Battery Sgt. Major in the 49th Brigade, Royal Field Artillery. His service record won him a responsible job as an attendant at the Royal Courts of Justice in London. This would have been the equivalent today of a security officer at the Courts that saw the most serious cases come to trial. Whether he volunteered for service in the First War or whether he was approached first is something else we do not know, but obviously due to his experience being needed he was granted a wartime commission in February 1915 as Lieutenant. In August 1915 he was promoted to Captain, so we can assume that he was a good and reliable officer. The next notable date on his military record is January 1st 1917, when his award of the Military Cross was gazetted. The citations for Military Crosses were then seldom published. There is no mention of any specific incident and New Year’s Day Military Crosses gazetted were often given for general long-term bravery rather than for one particular occasion. What does seem highly unusual is that his Military Cross was presented by King George V himself on 29th August 1917. There were so many Military Crosses awarded that the King would not have been able to present all of them himself. So far, Sidney Alexander seems to have had a spotless character, but he let himself down when he was charged that on the night of 11th-12th February 1918 he was drunk in the field and secondly found to be taking part in a disturbance together with n.c.o.s of his section. He was tried on both charges at Clartres on 23rd February. Initially he planned to plead not guilty to the second charge, but was persuaded to change his plea,although it is doubtful that this was sound advice. He was found guilty and dismissed the service. This seems to us to be a very harsh treatment to a man who had given 25 years of his life to the army. Many an army officer much senior to him had got drunk in uniform and for three years Alexander had been through all the horrors of war. What would have upset Staff officers would have been that he got drunk with n.c.o.s rather than other officers. Today we can understand how, under the pressures he had suffered, and after 21 years as a ranker he would have been far happier with the company of senior n.c.o.s of his own class rather than the young public school officers around him. The class system was still strong in those days and both Staff officers and those running the bases and the War Office would have looked down on ranker officers, often referred to as “temporary gentlemen”, however good they were at their job. The original sentence of the Court was that he was to be Cashiered. This was a most severe punishment and meant that on return to civilian life he would not have been able to work in any part of the Civil Service, even as a postman. He would have lost his job at the Royal Courts of Justice in London and would not have been able to join the Territorial Army after the war. The Commander-in-Chief, Field-Marshal Douglas Haig, saw this and commuted the sentence to the lesser one of being dismissed the service. To discover the attitude of Staff officers, we have to look no further than the writings of Douglas Jerrold, a great friend of one of our most notable – and controversial – Frontiersmen, Hugh Pollard. Jerrold fought with the Royal Naval Division both at Gallipoli and in France and wrote the history of the Royal Naval Division in 1922. What the army needed was more Alexanders, even if they did break the rules at times, rather than eighteen year old public schoolboys as Second Lieutenants. By 1918 the call-up age had been extended and at 44 Alexander became due for this. He could not be traced but was believed to be working in Wales in what was termed a “controlled establishment” and this made him exempt. Alexander claimed that he had in fact re-enlisted and served as a private soldier in Russia, but this could not be substantiated. After the War he enlisted in the 7th London Brigade R.F.A. (T.A.) and in April 1920 he was made Battery Sergeant Major. Again the War Office had to be consulted as to whether it was permitted for a man who had been dismissed as an officer to serve as an n.c.o. in the T.A.. After much discussion over many months, in January 1922 the desk-bound officers in the War Office decided that this was indeed permitted and also that he would be allowed to wear the ribbon of his M.C. on his uniform. It would have been most unusual for a B.S.M. to be seen on parade wearing the M.C. ribbon. When he retired from the T.A. he was enlisted with alacrity by the Legion of Frontiersmen as the Legion’s R.S.M.-in-Chief. We know he was still serving in 1936, but have not discovered the date of his death. The reader can see from the above that we have much still to discover about him. It is currently not known what happened to his M.C. and other medals, although most came up for auction in 2017. They are not in the Royal Artillery Museum. This is a most human story of a true Frontiersman and it is appropriate to commemorate him one hundred years after the end of a war in which he fought with great bravery and dedication. Surprising Snippets 8: An unsolvable mystery is, who was the person from which official government or military department who decided that the file on the Frontiersmen and Remounts in the last quarter of 1914 was not worth saving at The National Archives? The matter was probably controversial at the time as, although for the first months of the First War Remounts were handled by private contractors and not the army, what position did the Legion of Frontiersmen hold? We know that during those first months Lt.Col. Driscoll bombarded the War Office with requests to use the Frontiersmen as a named unit for various duties on active service. The War Office rather vacillated before they finally instructed Driscoll early in 1915 to form the 25th Bn. Royal Fusiliers (Frontiersmen). Inspections of the Frontiersmen in their uniforms were arranged at a special London parade and the War Office thought they might be able to use them on active service, but then changed their minds. The army required thousands of horses – far more than could ever be provided in Britain even by commandeering all the horses in private hands they could find. Horses were plentiful especially in Canada but also in the U.S.A. and other countries. These began to be shipped over in quantity. The problem for the War Office was that the horses were unbroken and they did not have the number of soldiers with the skill to break them. Private contractors were employed but they could not find enough skilled men. In the meantime Frontiersmen were pouring into the country from all round the world desperate to enlist and serve the Mother Country, often working their passage as they could not afford passenger fares. Many of these men had been working with horses on ranches in the big countries of the world and also many of the British Frontiersmen had done such jobs when abroad. It was a pre-requisite to being accepted by the Legion that you were a skilled horseman. All these men were keen to serve the Empire in uniform; they were men of experience and years who had often fought in South Africa. Driscoll was keen to keep them until he was granted a Frontiersmen unit, but these men had a multitude of skills which caused them to be eagerly sought by existing regiments so there was a steady loss of numbers which Driscoll was keen to minimise. The solution was an extraordinary one by War Office standards. Two big camps were set up over many acres at Shirehampton, near Avonmouth Docks, and Swaythling, near Southampton Docks. Both camps were under the command of a semi-retired senior officer, but the day to day running of these camps was undertaken by the Legion of Frontiersmen. For the records, they were considered as private contractors, but wore Frontiersmen uniform and ranks and were under the control of Legion London HQ with Driscoll at its head. Capt. Prior, O.C. N.E. Squadron, has received instructions from Col. Driscoll, D.S.O., that a few hundred men are required to go into mounted depot for provisional training, either at Shirehampton, Bristol, or Shrewsbury. As already two of the Southern Squadrons are doing duty, it is probable that only one hundred or one hundred and fifty men will be required for the first contingent in the Northern Command. The date will be between October 10th and 15th. The rate of pay is 24s per week and barrack accommodation, all men to enlist as troopers, and N.C.O.’s will be made according to qualifications. (“Sunderland Echo”, 29 September 1914). Calculating on the six-day week current at the time, the pay was 4 shillings a day, which compared very favourably with the pay of a private soldier of one shilling and one penny a day and a cavalry trooper of one shilling and ninepence a day, even though that would be for a seven day week. (twelve pence made a shilling and twenty shillings one pound). Just a few lines to let you know all is well up to the present. We are ‘up to the neck’ with Canadian horses – emptied one more ship load today, and there is another one due tomorrow. The accommodation is not yet complete, and we are having to turn them out in the large meadows and catch the bounders as we want them with lassoes [sic]. The meadows are one vast mass of partially wild, unbroken horses which afford us some great excitement. It is not a matter of flying shot and shell but of flying hoofs. However, it is a magnificent sight and worth the risk. We get any amount of spectators while we are putting the animals through their schooling. I have been chosen with a few others for this somewhat risky job, while the remaining portion are otherwise occupied grooming, etc. We have often to ‘throw’ the horses before we can get on the bridle and saddle. I like the life very much. It is not surprising that they attracted many spectators for what amounted to a free “wild west show”! Meadow after meadow was fast being converted into a great township of wooden structures with corrugated iron roofs. …one pauses in wonderment at the mere spectacle of a young [poetic licence!] Frontiersman astride a rearing and plunging horse, which bucks and jumps, side-slips and feints, in a manner which would astound many a clever circus equestrian. There are many types of horses included in the remounts supplied from across the water. Some appear somewhat tired until a saddle is placed on their backs, and then the fun begins. Yesterday there was splendid scope for the cinematograph operator. The scenery was such as the Vitagraph Company or their compeers [sic] could revel in, and the ‘action of the piece’ lacked nothing in sensational movement and incident. (“Western Daily Press” 30 October 1914). It has to be regretted that the official file on the Frontiersmen work on Remounts, which was of great importance to the early months of the war, has not survived; it shows the Legion at its best. Perhaps the War Office was careful not to show that it was bending a few rules and recognising the value of the Legion of Frontiersmen? Tobin with Roger Pocock c1934. Photograph reproduced by kind permission of the Tobin family. I remember the great Roger Pocock very clearly in his Frontiersmen uniform and with his grey/white beard. He was a kindly quiet-spoken man for whom the Skipper had a tremendous regard…I treasure the memory of Bill Tobin, splendid in his uniform, a big, strong, big-hearted man, every inch the soldier, astride an enormous horse. (letter Peter Tobin to his sister Daphne, 30/03/1984 in response to an enquiry from us). and in his account of F.C. Selous in the previous “snippet“. His early military career has not been verified but he is believed to have served in South Africa in the Imperial Yeomanry and then in the Transvaal Mounted Rifles (where he was wounded) also in the 1906 Zulu Rebellion. After this, until July 1914 he was working in Rio de Janeiro where he married his Brazilian/Irish wife. Like Lt.-Col. Driscoll, Tobin originated from a land-owning Irish family and with their common links it seems likely that Driscoll would have wanted to take Tobin to East Africa as one of his officers, but his complement was quickly filled. Tobin was commissioned into Winston Churchill’s old regiment, the Queen’s Own Oxfordshire Hussars until he was discharged in May 1917 with serious shrapnel wounds to his neck and face. After he had recovered sufficiently he served as a Captain commanding a company of the officer cadet unit of the Oxfordshire Yeomanry. Following the war he returned to Brazil for some years. On returning to England in the late 1920s he became O.C. of the Erith, Kent, Squadron of the Legion. He worked for the Atlas Preservative Company, owned by the Thatcher family, which was made very successful due to the skills of the young Denis Thatcher. Denis became a well-known name when he married politician and later Prime Minister, Margaret. According to Bill’s daughter, the actress June Tobin, Denis was not much liked by the firm’s staff. Fighting had been going on one September afternoon, and from his house the C.O. 56th Kent Battalion Home Guard watched formation after formation of Hun ‘planes broken up by our fighters. There was an incessant crash of fire from our ant-aircraft guns, light and heavy. Prudent people were either in their own dug-outs or in air-raid shelters. There seemed to be no pause between the enemy daylight attack and the even heavier raids which began when darkness set in. It was only when night fell that the full effects of fires could be seen. That night he had to go on duty as Umpire at an Exercise, but he left home at five o’clock because of a number of Home Guard duties he had to perform. So he went straight from his Headquarters to Dartford Heath, where the exercise was laid on, and which was to begin at 9 p.m.. Elements of the Battalion were opposed to a detachment of the Guards. By 9 p.m. the blitz was at its height. Fires were burning across the Essex side of the river. There was an enormous blaze at some oil depot on the Thames. Woolwich Arsenal seemed alight, judging by the enormous glow in the sky. Searchlights were probing the skies in all directions, and the A.A. guns on and around the heath cracked out continuously in almost deafening uproar. In this ideal setting the exercise commenced. The O.C. thought: ‘ Well, here it is, the invasion has come.’ His men were ordered back to their respective Company areas and he returned to Headquarters and waited for orders. A little later he left and returned home on being informed that he could remain in the vicinity and be contacted by ‘phone if the necessity arose. On arriving home the O.C. found the family up, but his wife away. She had gone to Woolwich. The glow over there was brighter than ever, and as he had some posts to visit out in that direction, near Plumstead, he stepped into his old car and set off. On the outskirts of Plumstead he was stopped by a Home Guard picket, whose orders were to allow no cars to pas through, as the road further on was impassable. In the middle of the argument as to whether or not he should proceed any further on his way, a Hun ‘plane above dropped a cluster of incendiaries. Some of these fell upon some houses close by, and off dashed the picket to help put out the fires. Plumstead was only a little way ahead, so the C.O. went along in his car and soon found that the road was indeed impassable. He spent the night visiting posts in the Battalion area and returned home at six in the morning. Five minutes afterwards his wife walked in, having spent a nerve-racking night in Woolwich. She had gone there to have her hair dressed, in the middle of which the blitz struck the town. The hairdresser, however, was a plucky girl, for she stood up to the ordeal and finished the job. A kindly police officer conducted the C.O.’s wife to a public air-raid shelter, where she spent the night; and a companion in the shelter, who turned out to be a bus driver, took charge of her at daybreak and managed to find a bus on the outskirts of the town to take her home to Erith. Life for many Frontiersmen was a succession of adventures. We continue to attempt to relay any of their stories that we manage to discover. ‘That naive conclusion, which owed as much to the imaginary spies of Willam Le Queux as to the real machinations of German Intelligence led directly to the foundation of the British Secret Service.’ (“Secret Service” by Christopher Andrew p.58). In his book Professor Andrew is quite scathing about Le Queux and his stories of spies, but, even if virtually all the stories were complete fiction, the above statement by Britain’s most noted historian of Intelligence means that Le Queux was historically important. The problem was that Le Queux, being a good storyteller, latched on grains of truth, on suspicions, on imaginations, embroidered them out of all proportion – and then believed the whole lot himself. ‘At least part of Le Queux’s secret lay in his immense clubability. He moved effortlessly around clubland and society dinners, establishing a reputation as a wit and raconteur.’ (“Secret Service” p.45). Much of newspaper and writing circles centred around the Savage Club, whose members included many of the ‘German spy menace’ writers. Roger Pocock, the Founder of the Legion of Frontiersmen wrote in his diary how he was asked by Edgar Wallace to propose Wallace for membership of the Savage Club. Roger Pocock, himself a romantic, eagerly followed the words of the master story-spinner William Le Queux. Legion members were convinced of the German menace. The stories they told in the early Legion days of German spies – and of revolution in some far-off countries – may have owed more to fantasy than fact, but the German spy scares were believed by a considerable percentage of the British population. Le Queux’s highly successful “The Invasion of 1910” first appeared as a serial beginning in March 1906 in the “Daily Mail”. Assisted by a naval expert, H.W. Wilson and advised by the elderly Lord Roberts, Le Queux had reconnoitred much of England to discover what he thought would be likely invasion routes for the Germans. When it was presented to Lord Northcliffe he instructed that some of the routes be changed to cover areas where he considered sales of his newspaper could be boosted. Northcliffe then advertised in other newspapers the districts the Germans would be attacking the next day. On the first day of publication the “Daily Mail” sandwichboard men paraded through London streets in blue uniforms with spiked helmets. The Prime Minister was furious, telling Parliament that Le Queux was a ‘pernicious scaremonger’ and that the story was calculated to inflame and alarm. Northcliffe was more than happy as it boosted the sales of his newspapers. When it came out in book form “The Invasion of 1910” sold more than a million copies in twenty-seven languages, including German, although the Germans changed the ending to show a German victory. 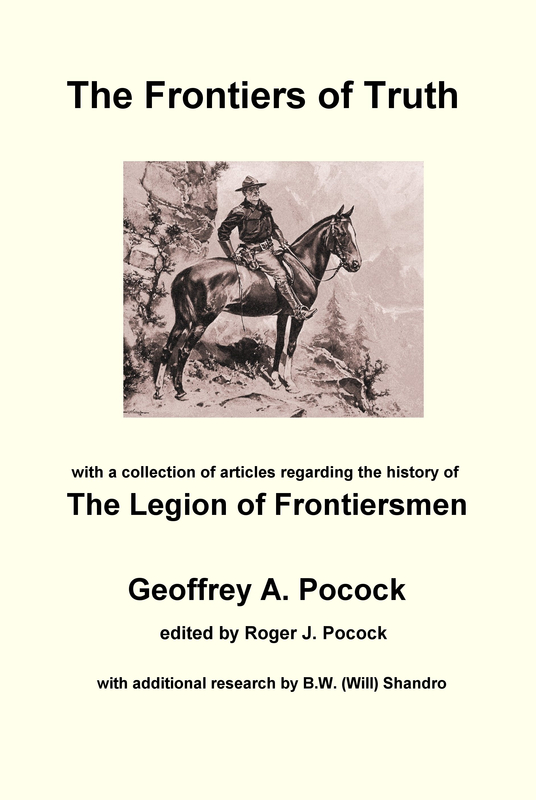 The Frontiersmen featured heroically in the book ‘…that splendid corps, the Legion of Frontiersmen…’ (p.289), ‘…the daring actions of the”Frontiersmen”…’ (p.335), ‘This place was held strongly by British Infantry, many members of the Legion of Frontiersmen, – distinguished only by the little bronze badge in their buttonholes -‘ (p.359), among other mentions. The War Office found some of the German spy stories passed to them most irritating, although Vernon Kell, who in 1909 became the head of the newly-founded Secret Service Bureau, in 1910 found the activities of the Frontiersmen of interest. ‘I saw L at the officers on his return home from the East Coast where he had been trying to get in touch with some of the Legion of Frontiersmen…I will enter them among my likely agents.’ (T.N.A. KV14). There is no doubt that most Frontiersmen in Britain were convinced by the stories of German spies. In his 1931 “Chorus to Adventurers” Roger Pocock tells many stories based on the Le Queux scare stories and others that were circulating, most of which sound ridiculous to modern ears but did not do so then when the threat of German military aggression was generally believed. ‘There was to be a German feint upon Essex, made in the hope of containing our Southern Command on Epping Forest for the defence of London. On the details of this operation Lord Roberts gave three month’s instruction to a member of the Legion, Mr. William le Queux, and the result was a forecast novel in the “Daily Mail”. (Chorus to Adventurers, p.63). Forecast novel it may have been, but Le Queux steadily began to believe that his own predictions were based on facts. ‘When the German invasion scare was at its height in Britain between 1906 and 1910, Baden-Powell was sold a bogus invasion plan by an enterprising group of German-American forgers who had set up a ‘spy-bureau’ in Belgium. They contrived to sell similar material to Major-General J.S. Ewart, the Director of Military Operations, and to William Le Queux, the espionage writer.’ (Baden-Powell, by Tim Jeal, p.153). ‘Each district upon the eastern slope of Britain was allotted to one German officers, who spent his furlough there…He knew…every detail of military interest. German officers were not welcomed at country houses, or popular at inns. They had a club on the east side of Regent Street, and large numbers frequented an hotel at Ventnor [Isle of Wight]. Along our coasts an astonishing number of respectable “Swiss” residents had houses overlooking the sea…(Chorus to Adventurers, p.64). After Roger Pocock had all official position in the Legion withdrawn from him in 1909 even the London Commandant (later Chief Executive Officer) Lt. Col. D.P. Driscoll made a highly extravagant claim about the number of German spies in Britain. From 1910 onwards the Legion concentrated on preparing for the war with Germany that they were convinced would come. We may find many of these spy scares bordering on the ridiculous, but the Edwardian reader of the populist newspapers such as the “Daily Mail” and the “Daily Express” (edited by another Frontiersman, R.D. Blumenfeld) was genuinely scared of a German invasion. William Le Queux had touched a raw nerve and picked up and played on the mood of the British public. We may wonder how much of his writing ever came to be believed, but those were different days and we have to return to Christopher Andrew’s comment that William Le Queux was a catalyst – even a major cause – of the setting up of M.I.5. And you thought that “Fake News” was a recent invention! ** Since the death of Bruce Fuller, the handling of his biography of de Hora has passed to his research associate Susan Hora. Please contact us if you require contact details. *** Quotation by kind permission of the Roger Pocock archive at the Bruce Peel Library and Archives, University of Alberta.